Wash the radishes, trim the stems and roots and cut in half. Heat the butter and bacon grease in a skillet over medium heat. Add the radishes, tossing to coat in the butter along with the salt and pepper. Cook the radishes for 15 minutes, stirring occasionally until browned and softened. Next add the chopped garlic, stir and cook one minute more. 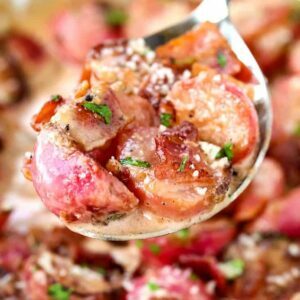 Add the broth, cream, rosemary, parmesan cheese and bacon to the skillet, stirring to combine with the radishes. Cook for 7-8 minutes over low heat until the sauce has thickened. Check to see if more salt and pepper are needed, then serve immediately.